I am brand new to the cloth diapering world, but I absolutely love it. Like, love love love it!! Why? Well, besides the whole "more environmental" aspect of it, it is a lot cheaper, it's totally easy, and seriously... could those cloth diapers be any cuter!?!? I. Think. Not. Today I set out to make my own reusable cloth wipes for diapering. It's been tricky using the regular Huggies and Pampers wipes with reusable diapers -- yah, it kinda defeats the purpose of saving the environment -- but I was having to make a pile of used wipes for the diaper change and then carry them to a trash can to throw them away. Now.... I have cute, super soft, reusable wipes that I can just wet with a little bit of water, wipe my little one clean, and toss in my wet bag with the dirty cloth diapers. Then dump it all in the laundry and I'm good to go! I order some of the softest ever fabric from an Etsy shop called Vancouver Bamboo. The shop is located in Canada (duh!) but they will ship from the U.S. My package arrived within 2 days of it being shipped. The owner was so awesome to deal with. I ended up overpaying a little for shipping so she threw in an extra 1/4 yard to account for the extra $ I spent. Love it! Great customer service. Great! Okay, enough gushing over the shop, back to this amazingly soft fabric. 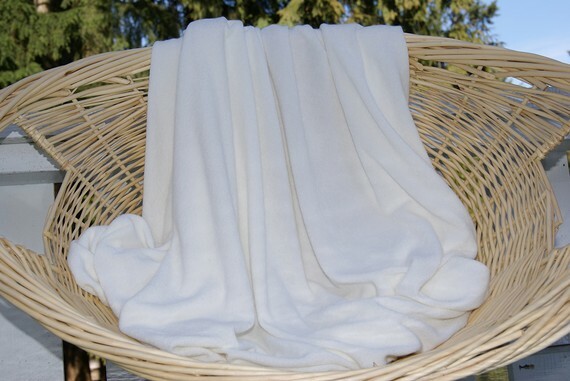 It is 100% Organic bamboo terry cloth. Here is the one I purchased. It is called the Baby Terry fabric and is perfect for the cloth wipes I made as well as cloth diaper inserts, wash cloths, bibs, and so much more!!! So... how did I make them!?! Simple. Cut a 8" square out of the fabric and serge around the edge. That's it. Easy peasy! If you don't have a serger you could ask around for someone who does to see if they could do it for you, or fold each side over twice and straight stitch along the top. If you want a double thick wipe, sandwich two squares -- right sides together -- sew around the square leaving an opening of about 2". Snip your corners, turn your square right side out and stitch around the top to hold the two pieces together and close the opening. Honestly though, if you like to sew and you don't have a serger you should get one. I used credit card points and redeemed them to Wal-Mart to buy mine. It has probably been the BEST thing I have redeemed points for... ever! I made a ton of these little guys and filled up an empty Huggies wipes box. Oh yah... did I mention that!??! These are the perfect size to store in there. Just fold it in half and plop it down in. BUT.... I actually ended up making a couple extra. Lucky you! If you don't use cloth diapers... use them for wash cloths, hankies, face wipes after meals... or for yourself! They are so soft you'll want to! Promise! • Share this post on Facebook or on your blog and leave me the details. The winner will be chosen by random.org on Wednesday April 3, 2013 so be sure to get those entries in!!! Shake well to mix then pour over wipes. I am careful to make sure that I go through my entire box of wipes within 2-3 days otherwise you could develop mold. So make sure you keep using them! I really love this idea! So cute and they look so soft! I figured cloth wipes would be easy to make....I actually wondered if you can just cut up some fleece and not even sew anything! Darn, missed the giveaway. I really need some cloth wipes too! I'm having the same problem where I have a pile of wipes to throw away after changing the baby's diaper. I currently use cloth wipes with pe diapers but I'm nervous to use them with poop diapers. Do you rinse them before throwing them in your bag? It's a pain having both kinds of wipes! If you were to ask me, I would also prefer cloth diapers instead of using those typical diapers in the market. I believe it’s more comfortable and fresh compared to the other one. My nephews and nieces would agree too! The bad side is you get to wash and wash everyday.